The easy part is done- you've made the decision to cloth diaper...Now comes the fun part, building up your diaper stash! You've searched the web, asked cloth diapering friends and researched until you're blue in the face trying to figure out which diapers are the best and have come up with a million different answers. The reality is every baby is different, just as every diaper is different and so what works perfectly for one may be horrible on another. The best thing to do is try a little bit of everything before deciding. And to make that easy- Thanks Mama offers some wonderful sampler packs to get you started. Thanksmama.com is family owned and operated natural baby store. They offer a great selection of cloth diapering products, potty training pants, swim diapers, natural baby care products, baby carriers, bibs, toys, nursery furniture and bedding, strollers and much more. They look for innovative products that are good for the baby and the environment and they never forget that most families are on a budget. That’s why Thanks Mama offers the Lowest Prices, Free Shipping on orders over $60 within USA, 90 days easy returns; Buy Safe Guarantee and Price Guarantee. Thanks Mama does ship worldwide! If you want to be up to date on everything cloth diapers, know about current promotions, want to read and participate in discussions about natural parenting, modern family fun and challenges, green living; not to mention participate in weekly Giveaways, Sweepstakes, Twitter Parties and Contests, follow Thanks Mama on Facebook, Twitter, Blog, Pinterest or Google +. 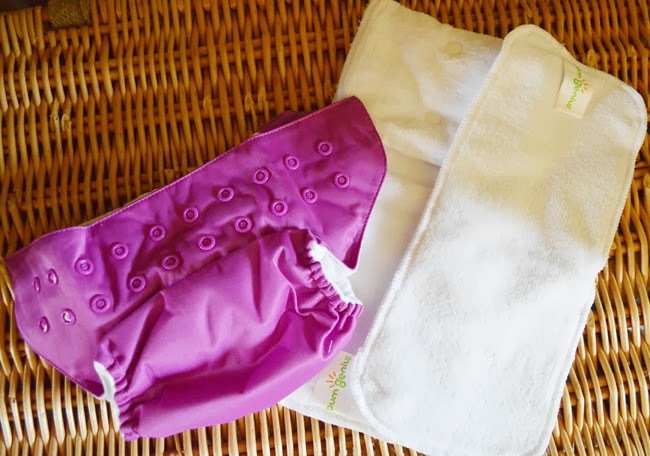 For this review, Thanks Mama was kind enough to send me their Favorite Easy To Use Cloth Diaper Sampler. This sampler features two pocket diapers that are very popular in the cloth diapering world. Pocket diapers are a great option for many- easier to use that flats and covers, but still allowing to adjust absorbency for nighttime diapers or heavy wetters. Included in my sampler was a Bumgenius 4.0 in Dazzle and a Fuzzibunz Perfect Size in Candy Apple. I was already familiar with and loved both brands (the majority of our stash is Flips & Fuzzibunz One Size Elite), but had never tried these particular styles. The Fuzzibunz Perfect Size was in many ways like the One Size Elite we already have. Both feature a stay dry layer for baby's skin, waterproof outer layer and microfiber inserts. The biggest difference being that the perfect size does not offer rise adjustments. The perfect size also includes only one insert, sized to fit. Typically, I tend to prefer one size diapers, but I actually discovered that compared to the OS of the same brand, I actually prefer this. It was a much trimmer fit and just seemed to work better for our little miss. I actually even went with the medium size even though our little miss is 2 pounds shy of the minimum weight of 15 pounds. Still, it works well now and I know will be even better once she's a bit bigger. 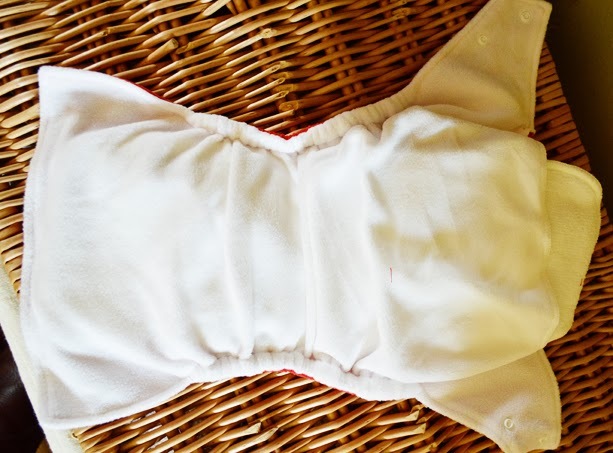 The Bumgenius 4.0 is a one size pocket diaper that fits babies from 7 pounds to 35 pounds. They include both a one size insert and a newborn insert. The newborn insert is perfect by itself for smaller babies, and serves as a great doubler for nighttime diapers for bigger babies. I love the unique snap down feature of the one size insert, allowing for the perfect fit, regardless of rise. And it works wonderfully. 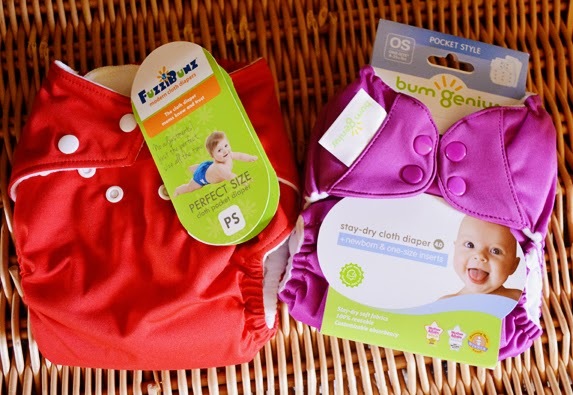 If you've wondered why Bumgenius is among the most popular brands in the cloth diapering world, it's because they truly are great diapers...for our girl, they have one of the best fits, offer plenty of absorbency and just work really well. The 4.0 is no different! And one very lucky winner is going to win a $25 gift code for Thanks Mama. You can purchase your own sampler, a different cloth diaper, baby carrier...whatever you'd like! Enter using the Rafflecopter form below. i would get a couple of small thirsties covers! I think I would get a Kissaluvs Marvels One Size All in One Cloth Diaper! I'd like to try a Kawaii diaper! i would get a thirsties duo fab fitted, and a babykicks fitted! A sampler pack- we'd?re just starting our stash. I'd get a couple KaWaii diapers. Maybe a bumgenius since I don't have one yet. I would get a fitted, maybe some prefolds! I'd buy a BG 4.0. Definitely a fitted! I've been wanting to try one for night time! I figured it out but i had to go in a different way. I would get some Bumgenius Newborn Diapers. I'd like to get a few thirsties diapers. I might buy an iPlay Organic Flannel Crib Sheet. I would probably get training pants or Thirsties Duo wraps. I'd probably get Homestead Company Belly Oil. I would buy some nursing pads. I think I would try a FuzziBunz One Size Elite Pocket Cloth Diaper with Free Hemp insert 3 Pack. I would do the Thirsty Duo I have twin girls and this would be so awesome! 4.0, they're tried and true! I'd get some babykicks hemparoos!!! loooove them! I would like to get an Imse Vimse trainer. I would buy a trainer or some detergent. I would get a Thirsties Duo Cloth Diaper. I would probably get bumGenius Elemental Organic One-Size Cloth Diaper in albert. More bumGenius! I'd love the bubble color. I'm in need of a diaper sprayer so I would put this towards that! I would buy a sbish snapless multi fitted. I have been wanting to try one for a while now. I would buy a bumGenius 3 pack! I would probably buy a Sbish OBF fitted! Probably try a Thirsties fitted. I have heard it is great but it is not cheap! babykicks hemparoo doubler and more bumgenius! I would probably buy the Kushies Ultra all in one diapers 5 pack! bg 4.0 I hear they are the way to go. I might get a Thirsties fab fitted! I want a Thirsties fab fitted! I'd like to try a BG! I'd put it towards a Sustainablebabyish Happy Little Clouds diaper for overnight use. Still undecided, but I do love BG's new Jules print. Perhaps I would get that. Or a sloomb fitted. So many choices! Tots Bots in pomegranate is what I would buy. I'd love to buy some prefolds and covers to add to my stash.